Micro-needle pen is a small and simple device, designed to micro-needles on the skin, promoting the formation of collagen and elastin, in addition to causing an intense cellular renewal. With this it has precise indication in facial rejuvenation, eye area, neck, Acne scars, stretch marks and smoothing of post-inflammation scars. 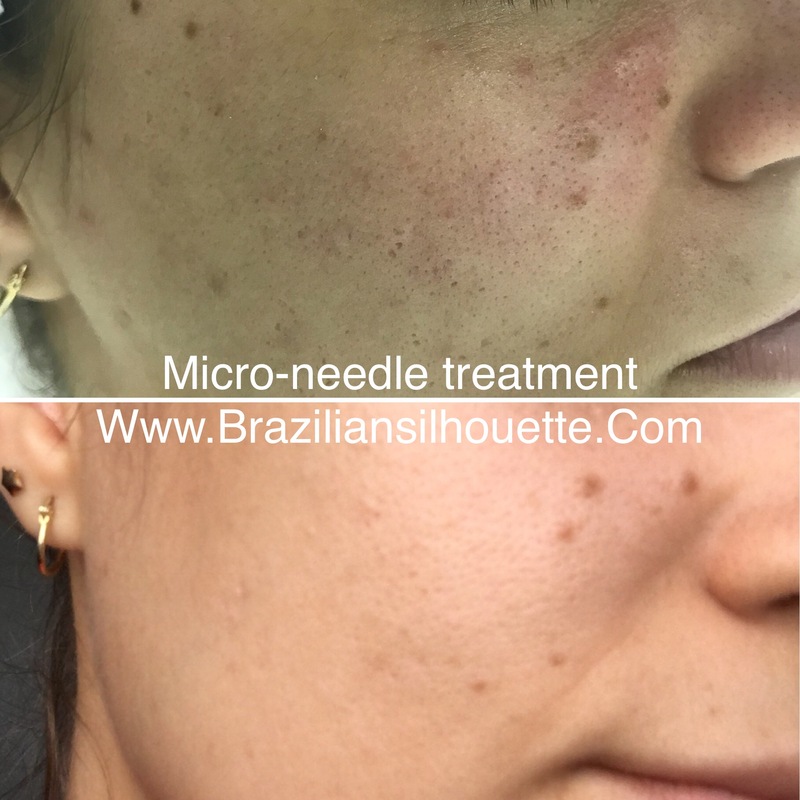 Micro-needle pen is an equipment consisting of a small needles, embedded by 36-42 tiny needles, whose purpose is to cause micro-lesions on the skin through "holes", leaving areas around them intact, almost microscopic, to serve as input regeneration of the lesion provoked. The needles (pen) may have 36 to 42 micro-needles. These needles may be from 0.5mm to 2.5mm in length. Needles of 3.0mm or more may only be used by physicians. HOW DOES THE Micro-needle pen WORK? By grinding the "Micro-needle pen" on the skin, thousands of micro-holes are made, thus causing an intentional injury to the skin. As there is intact skin around the furrow, it reacts to heal the battered skin. By doing this, large amount of collagen is formed throughout the area. The regenerated skin is now firmer and evenly regenerated. This is the same principle as the "Fractional CO2 Laser", which is an excellent, yet costly,treatment. The term "fractionated" explicitly means that around minimal lesions are intact areas of skin, which is determinant for a rapid recovery of the patient undergoing this type of treatment. Rejuvenation of face, neck, ear and hands. As an aid in the treatment of blemishes. There is no risk-free medical procedure. This device causes micro-lesions on the skin, so infection, herpes, scarring and even the formation of keloids (hardened and salient scarring) can occur in patients prone to it. .
After the first session you can already see the positive results. Generally, three sessions of 4 to 6 weeks are required depending on the purpose of the treatment and what type of needles will be used for more obvious results. It is important to say that any aesthetic procedure needs to be maintained for the duration of the treatment. It's no different with Micro-needle pen. In our service at Brazilian Silhouette, we promote the improvement of the results with the addition of cosmeceutical assets. Among these, we make use of Hyaluronic acid associated with the application of vitamin C in the procedure. In the intervals from one session to another we prescribe the continued use of vitamin C.
After the procedure the skin has redness (hyperemia), which can last up to two days, there is no need to get "stuck" at home. However,Brazilian Silhouette facial specialist recommend makeup only after 48 hours after the treatment. ANYONE CAN HAVE THE TREATMENT? Treatment with MICRO-NEEDLE PEN can be done on both men and women. People from any age can have the treatment of stretch marks and acne scars, even older people for smoothing wrinkles, sagging skin. Although very quiet, you also need care. MICRO-NEEDLE PEN has almost the same effect as laser, but is a safer procedure. However, post-treatment care is imperative as it is in laser applications. Among these the most important is the intensive use of nature good quality sunscreen with factor 30 or more. It is an easy-to-use device in the hands of a trained doctor. The application time of the device does not exceed twenty minutes, depending on the area to be treated, but this time is preceded by forty to sixty minutes with topical anesthetic passed in the area. With this measure there is practically no pain during the procedure.